"3LA1, V-1131" by Timothy K. Perttula and Robert Z. Selden Jr.
DECORATION: The thickened lip flanges have excised teardrop-shaped elements. The rim itself has three horizontal engraved lines that dip below the thickened flange portions of the lip. 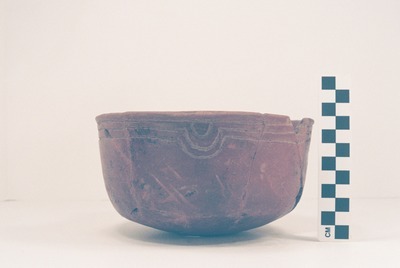 Bowie Engraved bowl (5425-736): a, photograph; b, drawing by Bobby Gonzalez.